This summer we have been pleased to have a new addition to our office, our summer intern Laura Esposito. 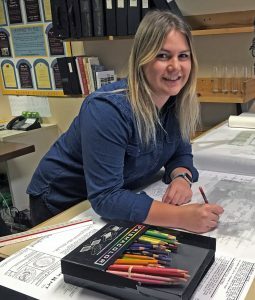 A 2015 graduate of the University of Pittsburgh, Laura is heading into her final year of the Masters of Landscape Architecture program at the University of Georgia. We sat down with Laura to find out how her internship was going so far. Kara: We try to give our summer interns a taste of everything we do at Pashek + MTR. What kinds of things have you been involved in this summer? Has anything surprised you or been different than what you expected? Laura: Since Pashek + MTR does a wide variety of work, I’ve enjoyed attending a lot of meetings and experiencing what goes into every kind of project; what the client needs, how the project will be developed and then constructed, etc. One thing I’ve noticed in particular is just how many different “jobs” a landscape architect has, from creating graphics, communicating with various stakeholders, or navigating a municipality’s zoning ordinance. An LA has to be aware of all aspects of the project, from generating initial design concepts all the way to construction. Kara: One of the things you’ve been helping us with is boosting the sustainability of our office operations for the Sustainable Workplace Challenge. Tell me more about what you’ve been up to with that. Laura: I’ve had to the opportunity to write a few sustainable office policies and actually set those policies into motion, which has been fun. As of early July, we have eliminated most individual trash cans at desks, which also eliminates the need for the plastic trash bags that line them. Traditionally, the cleaning service would come and replace the trash bags even if they had one piece of trash in them. We’ve switched to having one small trash can for each floor of our office, which should cut our plastic bag use by about 80 percent. Kara: What are the aspects of landscape architecture that you find most interesting and rewarding? Laura: I really enjoy the ability to exercise creativity in this profession. 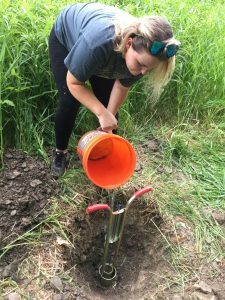 I became interested in pursuing this career because I wanted to do something that utilized my interest in the natural and built environments in a creative way. I also enjoy that design requires problem solving, which always challenges you think outside the box and push yourself. I would like my work to provide people with public space that fosters a sense of place and community, becoming a backdrop for everyday life. Kara: What are you looking forward to this fall when you return to school? Laura: I want to learn as much as I can while still in school. I will be writing my thesis this year, which is a pretty daunting task. Although I’m still trying to nail down my exact topic, I would like to write about the redevelopment of the Lower Hill District in Pittsburgh; the urban renewal efforts of the 50s and 60s created social issues still present today. I’d like to explore how landscape architecture can influence neighborhood identity using the principles of human-centered design. Besides school, I’m looking forward to Saturdays in Athens, which include football games and lots of tailgating. Go Dawgs! Not looking forward to the 90+ degree days. Kara: What do you see yourself doing five years from now? Laura: I see myself working for hopefully a small to mid-sized firm. I would like to get a variety of experiences in my first job, so working at a multi-disciplinary firm would be great. We’ve enjoyed working with Laura and wish her all the best as she heads into her final year of grad school this August. Thanks Laura for all your help this summer!